Fire load refers to the amount of flammable material and the amount of heat that can be generated by a substance if ignited within a given area. It is most commonly used to refer to the amount of heat that can be generated by the materials in an enclosed area. In the case of stacks of paper (which in our specific case is the most common flammable material), the fire load is to be calculated by multiplying the weight of paper by 2.5, or by assuming the weight of each linear meter of occupied shelf to be 75 Kg, divided by the overall room surface. Ionising and non ionising radiation released by Display Screen Equipment is not ‘harmful to the health of workers’ using such equipment: at a 5 cm distance from any point of the device surface, dose intensity never exceeds the 0.5 mR/h threshold specified by Presidential Decree No. 1428/68. Conversely, problems may be caused by wrong device positioning, prolonged static posture and/or poor room lighting. 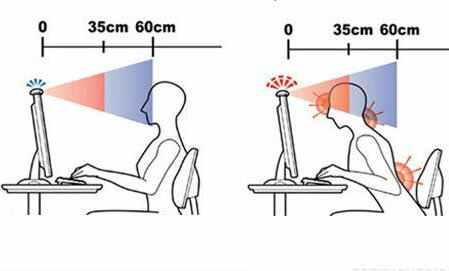 Vision and musculoskeletal problems are mainly due to prolonged static working postures. In other words, DSE users should change their posture regularly, every hour or so, and take full breaks from work with DSE every 4 hours. Under applicable OH&S regulations, employees constantly using DSE over the week for more than 4 hours a day, should take 15-minute breaks every 2 hours. Look at items that are 6 or more metres away.